Hung, the newly appointed Minister of Information and Communications, was among ministers questioned by legislators at a session Wednesday. In response to a question regarding the spread of false information, culturally inappropriate images and fraudulent activities on the internet and social networks, he said it is a growing global issue plaguing both large countries such as the U.S. and small ones like Timor Leste. "We have been living in cyberspace for only a decade, so we don't have much experience and the internet is still growing, but in real life we've had thousands of years in experience. So some logic from real life could be applied to cyberspace to tackle the issue of false information." To achieve this Vietnam must first establish the legal definition of false information by amending laws and then set up a tool to monitor and analyze Vietnamese messages on social networks, he said. But since some 100 million such messages are sent daily, this task cannot be done manually and requires the help of technology, he said. "The Ministry of Information and Communications has, as a first step, already set up a national center ... that can read, analyze, evaluate, and categorize 100 million messages a day." Besides, authorities need a "garbage sweeping tool" to remove violating contents and should step up their efforts to persuade foreign social networks to comply with Vietnamese laws, especially with requests to remove content. "We could learn from international experience, such as how the EU and some ASEAN nations have done it." He concluded that Vietnam must resolutely enforce the rule of law and punish people for uploading false information online. "Social networks are no longer virtual but are real, so we cannot not fight this battle. People and the government must spend more time in cyberspace; if the good increases, the bad will decrease. "[We must] step up communication to the people that information on social networks is not censored and so they cannot blindly trust everything they read." Around half of people in Vietnam are online. An April report by social media marketing and advertising agency We Are Social showed that Vietnamese are online seven hours a day and spend a daily average of 2.5 hours on social networks. Facebook and Google's YouTube are the most accessed sites with user ratios of 61 percent and 59 percent, respectively. 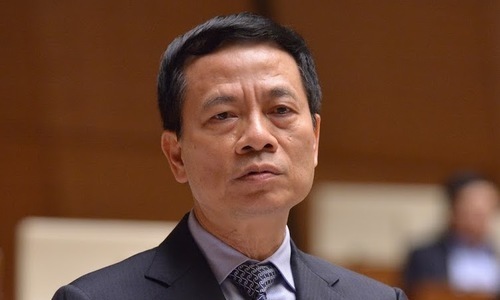 Hung, former CEO of military-run telecom giant Viettel, has been leading the information ministry since July in replacement of Truong Minh Tuan, suspended for violations in a TV acquisition deal. Hung's appointment was formalized last week during the ongoing National Assembly session. During a meeting with Prime Minister Nguyen Xuan Phuc in September, he also called for strong measures to manage social networks in Vietnam. Vietnam needs to create its own networks to compete with other tech giants like Google and Facebook, and to force the foreign companies to comply with Vietnamese laws, he said. He proposed that new policies are developed to facilitate the creation and growth of homegrown social networks, aiming to garner at least 60 million accounts and 60-70 percent of the social network market’s pie in Vietnam by 2022.